Occasionally, someone orders an SSL certificate they don't need and wants to cancel the purchase. If the certificate has not been issued yet, or you have a Comodo SSL, please send an email from the administrative email address on the account or submit a ticket and we can cancel and/or refund you. Note: If you get a red error message at the top, stating Cannot validate the information you submitted. then please try a different email address or try the domain with and without "www." in front of it. Once successfully submitted, you should receive an email soon after with a link to your user portal. Click the link and it will automatically log you in. You have ~24 hours to click the link. 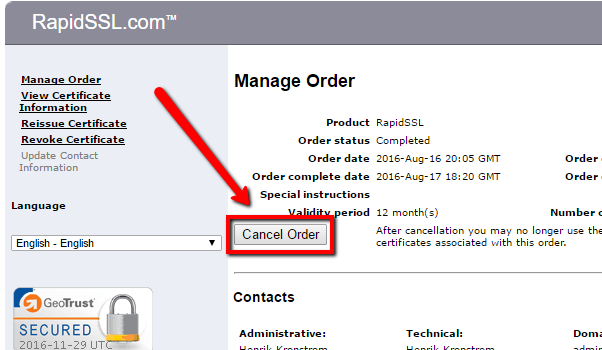 In your user portal, there will be a button at the top to Cancel Order. Once clicked, the order is canceled but it is not automatically removed from your Name.com account. To have it removed, please email support@name.com and clarify you have canceled the certificate and want it removed.